Vishal lashed out a BJP leader H Raja for watching a pirated version of Mersal. BJP leader H Raja recently found himself in a rather embarrassing situation when, during an interview, he admitted to having watched a pirated version of the recently-released Vijay starrer ‘Mersal’ And, needless to say, this created quite a buzz in the industry. 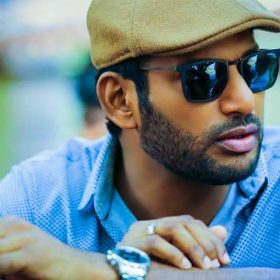 Now, actor Vishal has broken his silence on the matter and condemned his actions. In his hard-hitting statement, the star said that Raja’s decision to watch a pirated version of ‘Mersal’ is unacceptable as it sets a bad example. He went on to add that supporting piracy is ‘uncalled for’. “Dear Mr H.Raja, as a leader and prominent personality, you are advocating Piracy and blatantly agree to it ??? Dear sir, I, as a SINCERE Citizen, True Workaholic and a man who thinks twice to do anything wrong, seriously I wonder how a political leader like you can watch a pirated version of a film which sets a bad example. Totally Insensitive And Uncalled For… Vishal, Sincere Fighter Of Piracy,” he added. Well, these are some strong words and could create a buzz in the political circles. In case you did not know, ‘Mersal’ hit screens this Diwali and became the talk of the town in no time after the BJP objected to a scene which takes a dig at the GST scheme. Since then, several stars—right from Kamal Haasan to Vijay Sethupathi—have spoken out in the film’s favour And said that any kind of re-censoring is not acceptable. So, do you feel that the GST reference is justified? Tell us in the space below.